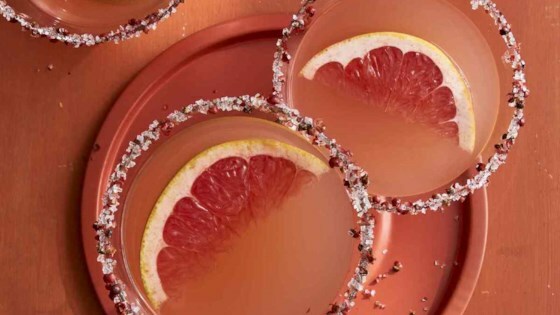 "This pretty pink martini is the color of spring with the flavors of winter citrus. Don't love gin? Use vodka instead! We rimmed our glasses with a fun mix of crushed pink peppercorns and coarse sugar." Combine gin, grapefruit juice, vermouth, simple syrup, and lemon juice in a cocktail shaker. Add ice cubes, cover, and shake until very cold. Strain into 2 chilled martini glasses. Garnish with grapefruit wedges. For a DIY simple syrup, stir together 1/4 cup sugar and 1/4 cup water in a small saucepan. Cook, stirring, over medium-high heat until the sugar is dissolved. Let cool before using. Store up to 2 weeks, chilled in an airtight container. I doubled the lemon juice and I LOVE it! So tart. Very refreshing. As written, using gin, it was very good. Here is how we tweaked it, and made it twice in 1 week. Ended up delicious.